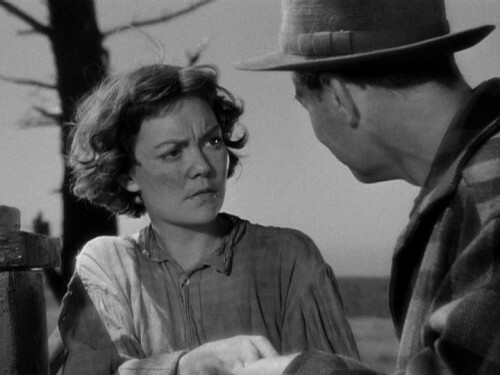 Jane Wyman stars as Belinda, a deaf/mute girl who is constantly belittled and greatly misunderstood by the residents of her small, farm-oriented town in Nova Scotia. Belinda lives with her father and her stern aunt, Aggie (Agnes Moorehead). A new-in-town doctor, Robert Richardson (Lew Ayres), soon enters Belinda’s world. He’s convinced that he can help her overcome her communicative ailments, and begins to train her in sign language with much success. Sounds like a happy success story, right? Wrong. Something happens to Belinda (which I won’t give away, as it was a complete shock to me, having not read the IMDb or keepcase synopses before watching) which will effect the rest of her life and causes a great scandal in town. As a result, the film plays out like the definition of an emotional rollercoaster. For every successful or happy moment that surrounds Belinda, she’s pelted tenfold by the debris of the life-changing event. An enthralling level of drama is continuous throughout the film, picking up even more as the film progresses toward its very suspenseful (and very satisfying) ending. This film was nominated for a total of ELEVEN Oscars, and I don’t think I’ve ever seen a film so fit for all of the accolades possible. All of the issues covered, from societal judgment to medical ailments to grief, are dealt with not only tastefully but powerfully. This is thanks in large part to the leading lady, Jane Wyman. She is absolutely phenomenal. I regrettably hadn’t seen very many of her films before renting this one from the library. I pretty much plan on checking out her entire filmography now, because she totally blew me away. I’m a firm believer that it takes a unique breed of actor and a whole lot of talent to be able to pull off a silent role successfully, whether it’s in a completely silent film or is just a major non-speaking role. Wyman embodies this belief of mine perfectly. You can almost see actual light emitting from her face as Belinda learns to sign, and you can feel every bit of pain that she feels as the many complications of her life arise. I’ve discovered a number of new favorite films this year, but this one’s the top. It’s one of the best films I’ve ever seen. Highly, highly, HIGHLY recommended! The score: 5/5!